Looking for a quick, easy, and gender neutral baby blanket?! This one is going to be your new go-to pattern! I’ve combined my two newest obsessions: Bernat Blanket Yarn and C2C (corner-to-corner) to create this extra soft and snuggly Teddy Bear Blanket! If you aren’t familiar with Bernat Blanket Yarn, it is a bulky weight, soft and cozy chenille-style yarn that is great for plush blankets, crochet baskets, and home decor accessories. This chunky yarn stitches up quickly so it’s the perfect choice for this project. Even with a small(ish) pixel graph like this one, you can create a nice size blanket! Plus it’s machine washable and dryable for easy care. If you haven’t tried the C2C (corner-to-corner) technique there are a couple of resources for you to check out. 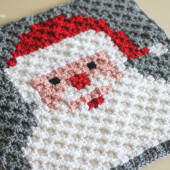 I have created several C2C projects like THIS one and THIS one that you can refer to, but you should definitely take a look at THIS VIDEO DEMONSTRATION by The Crochet Crowd which is a good starting point to learn how to crochet in the corner-to-corner method. NEW!! The Crochet Crowd has made video tutorial for this Bernat Blanket Bear C2C project! See their step-by-step video tutorial HERE. Big thanks to Kim Melikian from Knits by Kim who took the time to write out the pattern for this project! Click HERE to get the C2C Written Pattern in printable PDF format. 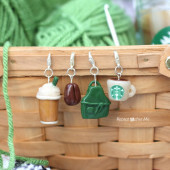 Choose from a variety of colors at yarnspirations.com! Border: 3 rounds of SC stitches along edges making SC + chain 2 + SC in the corners. One last round of SC stitches in the vintage white. OR get creative with a fancier border! Shell stitches? Picots? Anything you want! I seriously can’t get enough of this ultra soft and thick texture! Snuggle up and get cozy. Can’t wait to see what colors you choose for your teddy bear and background. Customize for a girl or boy or keep it neutral! Zoe under the blanket to show size! Did you use the big 300g balls of each color or the smaller balls? (Obviously, you don’t need much taupe (-: ). Thanks! It’s super cute! So Cute! Ever since your emoji blanket I have fallen in love with C2C projects. This pattern is definitely on my project list! Thank you so much for all the free patterns! How would I convert this using a regular yarn, like I Love This Yarn? It’s so cute. This is just TOO cute!! One more item to add to my to/do wish list!!! I can’t wait to find this yarn on sale! I love this pattern! I love this! Thank you for sharing. Did you use HDC or DC? Thanks! Use dc throughout and sc on border. Please let me know if you got an answer to this question. I just made this. This afghan is made in a rectangular shape so decreasing is different. Follow the graph and once row 30 is completed is when the decreasing starts but it is not an even decrease on each side as were the increases. Continue to work pattern from graph and it will fall into place. It works up very quickly using the baby blanket yarn and size L hook. So you used an L hook, not the J the the pattern calls for? What size do you end up with? I believe the chart is read left to right for one row and then right to left when you turn the blanket and so on… I should be starting mine this weekend so I will let you know more. I’d love to try this blanket!! However, I can’t get that chunky wool here in Zimbabwe. Would I be able to use a type of regular double knit wool? Love this blanket!! I’m trying to figure out something. I’m making a c2c with 25 rows and 36 columns. My question is, I have 11 rows that will have the same amount of squares (25), what do I need to do for these rows? I’m making a c2c with 36 columns and 25 rows. There are 11 rows that’s going to have the same amount of blocks (25). How do I need to do those rows so that they will have the same amount. After these 11 my decrease starts. Please write step by step instructions because I’m fairly new crocheter. Thank you. Love this blanket! Thank you for posting it. Any tips for someone new to corner to corner crochet? Hello…I love all of your patterns and have recently begun some c2c projects. If I wanted to use a different type of yarn for this particular blanket say Red Heart Super Saver….would I have to make a bigger area around the bear(teal in your blanket) and use a particular hook size to ensure the blanket is sized accordingly? Sorry, Sarah, but I found a problem with your supply list after I got working on this. You didn’t mention the yarn for the eyes and nose. I live in Toronto where you can get just about anything but had a problem finding a dark colour in the blanket yarn. I had to buy a big ball of the coal colour on e-bay. I could have gone to the knitting warehouse, etc. but the shipping would have cost more than the rest of the blanket. If I had realized this before starting it, I might have rethought the whole project or switched to another yarn. I believe the taupe color listed is for the eyes and nose with sand and vintage white are the main colors for the bear. Heather – you are so nice to answer questions. Can you please tell us what stitches to use for the graph? I see the graph but I have no idea what stitches to use. I bought all of the yarn but none of the weblinks go to a pattern. Please can you help? Where in Toronto did you get the go go green color? I cant find it in my town and im planning a trip next week to TO. Thanks for your usefull reply. Would love to do this, but is there an actual pattern I can follow. You know – Row 1, Row 2, etc. or am I supposed to figure it out by using the PIXEL chart, which by the way I cannot get to print. Any help would be appreciated. Thanks. I am having the same problem. Also, I would love the pattern for this. Help!! 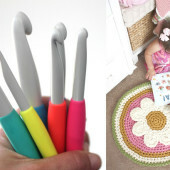 If you look up corner to corner crochet pattern, that is what is used. Begin with the bottom right corner of graph…. Thank you so much for another beautiful pattern im making this right now im using red heart light blue for the back ground red for the bear and yellow for the belly, snout and ears and black for the eyes and nose mine has turned out 24 inchs wide and 26 ichs high i am having a lot of fun making this and its looking awsome .thank you so much for this pattern. Haven’t been able to download blanketbear or see ya later alligator? Can you tell me why I cant print any of these patterns? By any chance do you have written instructions for the teddy bear graphghan ? I made your owl C2C blanket from the Lionbrand website and found it easier for me follow. I have made a square c2c blanket and just made wide enough and then started to decrease at both ends. I watched a video to make rectangular so I know to make the width and keep increasing for the length on one side but I have not followed a graph. Do I pick the half way point on the graph length row 15 or do I start after the width row 23. Please advise as I love the teddy bear and would like to make this my new go to blanket. Do I have to use the chenille yarn or can I use a chunky or bulky in lieu? Thank you for sharing your graph, it looks fabulous. Why are there no step-by-step instructions? Every link on your page here just tries to go to Facebook. Not everyone uses stupid Facebook. Go on red heart yarn’s website and search for corner 2 corner throw. That will give you the stitch that is used. Or you can find it on youtube. Once you’ve got the stitch, take the graph and start in the bottom right corner. there is a written pattern …go to Teddy Bear C2C written pattern courtesy of Kim Melikian.. hope this helps.. I can follow the written till it goes to the alternate decrease and increase rows… had to pull out a few rows to start over at the decrease row… any suggestions… i am also using a 6m hook… is that going to make the blanket to small? 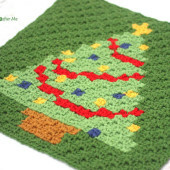 Could I crochet this in rows instead of corner to corner? You could probably work this pattern from left to right, you’d just use a DC stitch instead of the corner2corner stitch. Could you please tell me where I can download a row by row written pattern to know where and when to change colours to make this very cute blanket, thanks. I made this blanket for my grandson. It was the cutest thing I have ever done. I got so many compliments on the blanket. I had so much fun making it, I want to do another one. Would like to know if it´s the same if I choose to start from the left down corner instead of the right down corner on the graph? I began the blanket yesterday, ordered the yarn online from Joann craft and Walmart to get what the pattern called for. I watched several different videos for help. One showed you exactly how to use graph. My question, since the J hook is making the blanket so stiff, if I switch to K hook, or L, will I have enough yarn? At $40 for the project already, I don’t want to have to buy more, and risk as well a different dye lot. I did not see a guage given. Thank you. Hi! I have been asked to make this blanket with a sage green background and I cant find bernat baby blanket in the right color. Do you happen to know how the dimensions would be if I used vannas choice instead? Thanks!! I would like to have the printed instructions. When I click the link for step-by-step instructions it takes me to facebook. Can you help me get the printed instructions? I just finished my blanket. Can’t say I liked the yarn…I found it hard to work with and most likely won’t use it again. However!! Once I start a project I finish it! I also ran out of taupe with 5 rows left…grrrr. thankfully it was on sale and I had a coupon so that one ball only cost me 2.99! I also haven’t been able to download the pattern! I have read through all the comments with the hope that there might be a link to download the instructions in one of the other comments. I can only download the graph! And the only instructions that I see is for the border! A lot of people have asked the same question but didn’t get an answer! Can you please tell us if there’s a pattern or we are suppose to figure out on our own when to switch the colors by looking at the graph? where is the pattern? how do I get it? Is there any way you can post a video with instructions on how to get this blankets started? I love your teddy bear blanket. Unfortunately, I can’t see the pattern. Please help. I cannot print your Teddy Bear instructions. I have had no problems up until now. Could you send me the instructions by email? or PDF? My granddaughter fosters children and she got a new baby. Would love to make it for her. She is 10 days old. I am trying to make your teddy beat in c2c it has 30 rolls o the side and 23 rolls across how do I make c2c if it is. not a square? Where can I find the pattern for the teddy bear baby blanket! Hey! Awesome project! Just about to start but do I use a J hook like the pattern says or an L like you mention to use in your comments? Please let me know when you have a chance. All the best! The Cuddly Teddy Bear Crochet? There is no instructions could you please send me the instructions so I can start this awesome blanket. Please. Thank you Pauine. I have tried 3 times to make this bear, and for some reason I can’t figure the pattern right. Any chance there is a written pattern?? Thanks! Thank u so much for this tutorial….this is soooo cuteee…. Ive finished my blanket….just wanted to check out if i can give ur page link as reference in my blog. Thank you. I am going to try and make this for my granddaughter. I thought it was something that I was missing, but there are quite a few crocheters asking the same question. How or where do you get the pattern for the Teddy Bear Blanket? Just wanted to say thank you for another awesome pattern. My friend Is definetly going to love this. I’d love to know if you had a written pattern for this blanket. I really want to make it for my niece. YOU really do beautiful work. I crochet a little, defend myself like we say, but nothing like you. Have a wonderful year. God bless you and yours. It so cute. I would like to download the pattern. Think you. I’ve seen a lot of the comments and a lot of us are asking the same thing is there a written pattern? The Crochet Crowd has a video out explaining how to write out c2c pattern using the graph. It took me over an hour to look at the graph and write out the pattern . I haven’t done the blanket yet so I can’t share a story I’d wouldn’t want to steer anyone wrong if I made a mistake. You tube Crochet crowd bernat bear blanket for this hour tutorial on this blanket. This is the pattern for row 24, which is a decrease row. Did you increase at the beginning? If you increase that is where your extra block is coming from. If you need any more help, let me know. Thank you for this lovely free teddy bear pattern. I have had success with the written pattern up to row 24 where you say to decrease. Unfortunately if you do this at that point you are not completing the full teddy bear as the graph goes up to row 30 before it decreases. Could you please check this and let me know if I am reading this wrong somehow. If in fact, you do start to decrease at row 24 you throw the whole design out! I finally figured out how to do the decrease. You work the pattern up to row 23, start decrease on bottom left, and you will increase only the right side until you get up to row 30, then you will start decreasing again. Hi i tried like you said. Blanket looks little off towards left side. It doesn’t align with the previous rows. Can you please help. How does the back look? I’m wondering if the back has dangling loops . It worries me a baby’s toe or finger can get caught. I’m familiar w/C2C & I love the teddy bear baby afghan! I will be making this for sure! I probably over looked it, but I didn’t see anywhere what stitch you use? I agree. I’m using the J hook and it’s extremely stiff. I’d really hate to start over at this point though. When I finished my blanket it was not even and I followed the pattern exactly. Mine was the same. Have you received any tips on how to correct that? Eu amei esse cobetor de bebê. Você se supera em cada trabalho. É muito fácil e pratico de fazer. A ideia do gênero neutro é ótima, pois fica menos trabalhoso em escolher cor. Eu irei fazer para minha familia e farei algumas doaçoes para crianças pobres. Esse ursinho é encantador. Por isso amo crochê, dá para fazer maravilhas. I loved this baby cobetor. You excel at every job. It is very easy and practical to do. The idea of the neutral gender is great, as it is less laborious to choose color. I will do it for my family and I will make some donations for poor children. That teddy bear is charming. That’s why I love crochet, I can do wonders. I can `t download from google drive. can you email me that files,please? I’ve just finished my C2C bear blanket. It didn’t turn out a rectangle, it is a parallelogram. The sides do not line up evenly. Can you give me some tips on how to correct this problem? I want to make more for our Prayer Shawl Ministry. I am waiting for my yarn to arrive, so I can start this afghan. I can hardly wait, it looks like so much fun. Can someone explain the whole process of increasing one row and decreasing the next that is where I get thrown off. thank you! Good day, I would like to know if you don’t have a video showing step by step on making this blanket please. I am new to this and need some advice. I love this pattern. What I would like to know is how can I make it smaller, for a baby blanket? How do I order the Bobbin Holder you showed? I love this pattern but I’m wondering if it will work if I use a different type of yarn? It’s still a #6 weight but it’s a bit easier to work with. Just wondering if it will make the bear look disproportionate. Thanks! I love this blanket, do you have it in a knit pattern? What is the stitch gauge for this? I made it with the exact same materials and it came out beautiful but it is not 32 x 40. It is smaller than that. I don’t want to ruin it by trying to block it. Could you please share how to make it in bigger size like twin size? how do you make the blanket bigger? without making the border bigger. BIG thank you to Kim for writing this out! I just finished my bear, and every line was perfect. That must have been quite a job, but we really appreciate your efforts.